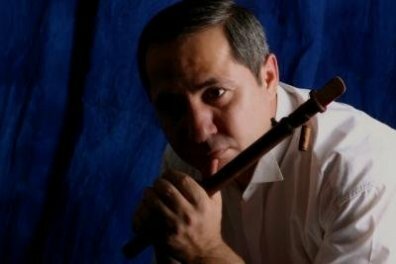 Famous Azerbaijani musician Alikhan Samedov, who plays a wind instrument -balaban, was awarded a special prize of TURKSOY. Secretary General of Turksoy Dusen Kaseinov handed the award to Samedov during a concert in Almaty, Kazakhstan. The musician was honored for his contribution to development of Turkic music. Samedov performed at the Turkic contemporary classical music concert at the Kazakh State Philharmonic hall named after Jambul in Almaty. Alikhan Samedov was born in Sumgait in a family of musician. He is well-known for playing wind instruments (balaban, clarinet, tutek, zurna, oboe, saxophone) and Azerbaijan’s regional folk instruments. His musical style varies from folk songs to works of famous Azerbaijani composers Tofig Quliyev and Alakbar Taghiyev. Samedov performed all over the world, including Germany, France, Japan, Spain, Singapore, Macedonia, Romania, Greece, Bulgaria and the Republic of Kosovo. He won awards at several international festivals in Turkey and Poland.